The ultimate goal for a beef manager is to keep feed costs low, but still meet the nutrient requirements of the cowherd, so reproductive performance is not impaired. The nutritional program should be simple and should supply the needed nutrients for the cow to give birth to a strong, healthy calf, milk reasonably well and rebreed after calving. Managing feed resources to attain a consistently high reproductive rate at a low cost is important in maintaining profitability. In order for these feed resources to be utilized by the cow, feed must be broken down to a level so it is absorbed through the gut lining. The stomach of the cow has four compartments: the rumen, reticulum, omasum and abomasum. The rumen is the largest and plays the greatest role in forage utilization. The rumen contains billions of microorganisms, fungi, protozoa and bacteria, which are involved in forage breakdown. This breakdown is accomplished by secreting enzymes that aid in the fermentation of the feeds in the rumen. Much of the fermentation products are volatile fatty acids (VFA), which are absorbed through the rumen wall and then travel via the portal blood vein to the liver. They are then converted to glycogen or blood sugar and ultimately energy. The rumen microorganisms have their own ecosystem and requirements, and are extremely important in energy and protein utilization. It is important that the rumen microorganisms’ requirements are met so the level of microbial activity remains high. This helps ensure that forage digestibility, which basically occurs in the rumen, will be at a high level. The life of the rumen microorganisms is variable, but in all cases is short (measured in hours). Thus, the population is in constant turn over. As the rumen microorganisms, which are single cell “animals,” build their bodies or cell walls they synthesize protein from nutrients available in the rumen. As they die of old age (a few hours after they are formed) they pass on down to the small intestine where they are digested and absorbed. This is referred to as microbial protein. At this point the microbial protein is utilized in the same manner as the protein that by passed the rumen, which origin may have been from soybean or cottonseed meal. Both protein and energy are important and must be supplied in adequate quantities to acquire satisfactory performance. Some have felt that energy is the nutrient needed for reproduction and protein is needed for growth. The fact remains that they are both needed for maintenance, growth and reproduction. What does that mean to the cow/calf producer? Amaferm® is proven to increase digestion and VFA production, which results in increased energy for weight gain. This chart shows a variety of gain studies from the starting to finishing phases of beef production. Average gain from all trials was 17%. The effect of Amaferm® is greatest during the weaning and starting period. Amaferm® may have its greatest effect on feed efficiency. Many University trials have shown an improvement in feed to gain. Overall, Amaferm® has resulted in a 6.4% improvement in feed efficiency in beef cattle. 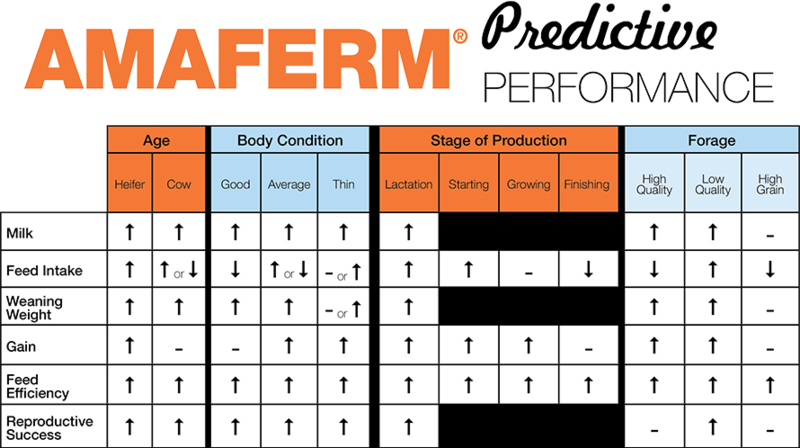 Amaferm® helps to stabilize the rumen environment, which is extremely important with high-grain diets. It has been shown to increase the growth rate of the several strains of the lactate utilizing bacteria Megasphaera elsdenii, Selenomonas ruminantium, and Selenomonas lactilytica. (Beharka and Nagaraja, 1998) providing a means to reduce the economic losses associated with feeding high-concentrate diets and lactic acidosis occurs (Waldrip and Martin, 1993). Amaferm® is so effective, that its addition increased lactate uptake over 700% by the ruminal bacteria Selenomonas ruminantium in one study (Nisbet and Martin, 1990). When digestibility is enhanced, and lactate in the rumen is decreased, then an improvement in feed efficiency can result. Increase in intake and efficiency resulting in more energy for milk production, growth and reproduction. More energy for milk production. More energy for milk production and improved efficiency potentially lower intake. More energy for milk production and improved efficiency intake could go up or down. More energy for body weight gain and milk production; improves efficiency and intake likely will increase. Expectation with a lactating animal would be increased milk production. Milk production will increase until genetic potential is reached when genetic potential met then expect lower consumption. Increase in milk production, body condition and reproduction. Energy not limiting so same milk from less feed. Generally more limited by capacity expect intake to increase. Will increase or decrease based on forage quality. If low quality intake goes up if high intake goes down. More energy means meets requirements sooner allowing reduced consumption. More energy means animal meets requirements sooner and consumption can go up if forage quality is low or or down if forage is high quality. More energy to increase body condition. Animals partition to body condition before milk. Intake will be equal or higher. Expected response would be an increase in intake on a forage based diet until genetic potential is reached for milk production. Intake is expected to increase during period of stress. Generally same intake but improved feed efficiency so more gain from same feed. Energy is not limiting so intake is expected to decline from improved digestibility. Increases in digestibility allow animal to meet requirements sooner resulting in lower intake. Increases in digestibility allow animal to increase consumption due to physical fill. Increases in digestibility lead to lower intake; same gain on less feed.. Increased milk production supports heavier weaning weights. Extra energy may go to cow body condition before milk production so we expect more variable response. If high quality and meeting genetic potential expect minimal but higher weaning weight; but earlier breeding does impact in subsequent years. Energy is not generally limiting primary benefit is lower feed intake not heavier weaning weights as milk is not expected to increase. More energy for more gain. More energy to meet requirements sooner leading to lower consumption and similar gain. More energy less intake same gain. More energy leading to more gain or less weight loss in early lactation. Increased comes from both higher intake and improved efficiency. Increased generally comes from improved efficiency and similar intake. Energy not limiting so gain will be the same and cattle will consume less. Determined by stage and genetic potential but generally in younger cattle increase in gain can be expected. Extra energy and intake translate into a consistent gain response here. Energy not limiting so similar gain on less feed. More meat or milk production per unit of feed is consistent. More energy leads to improvement in % bred and fewer days open which leads to heavier weaning weights in subsequent calf crop. More energy for improvement in % bred leads to heavier weaning weights in subsequent calf crop. High quality forage means needs are met and breeding is high. Expect same repro on less feed w high quality. Energy not limiting so expect same but will require less feed.